Design at SCQF level 6 is a practical qualification that will provide learners with the skills that they will need to progress to employment and/or further study, in architecture or interior design. The NC in Architecture and Interior Design is suitable for young people and adults who wish to pursue further study or enter a career in architecture or interior design. While entry to the award is at the discretion of the centre, it would be advantageous if the candidates have an interest in architecture or interior design. There are opportunities to progress to the Higher National Certificate (HNC) in Architectural Technology or HNC in Construction, or to pursue further study within creative industries courses such as the HNC in Digital Media, HNC in Contemporary Art Practice, HNC in 3D Design or HNC in Visual Communication. 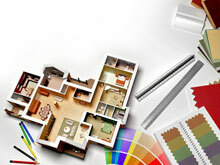 The National Certificate in Architecture and Interior Design at SCQF level 6 consists of six mandatory Units and 18 optional Units at SCQF levels 5 and 6. The NC has been developed to facilitate flexible delivery and integrate learning and assessment. A holistic approach to the delivery and assessment of the award is recommended, where possible. Assessment is intended to be practical in nature, reflecting the nature of the interior design and architectural professions. Peer assessment is an important feature of the assessment strategy as architecture is a career within the public domain and the use of critique both informs and develops an architect’s style. There are opportunities for theory-based topics to be assessed by multiple-choice online assessments with the use of multimedia technologies (eg video capture and interactive learning).